I recently wrote about how Google is increasingly handling a lot of the basics that customers used to rely on websites for. The sort of menial tasks like contact info, directions, and business listings that were important to communicate when the internet was a new-age phonebook. Back then, it was enough as a business just to have a website, basically a digital sign post to prove you existed. But the age of the website as an online brochure is long gone. Now, with Google’s (and others) increased footprint through business pages, search listings, reviews, rankings, maps, video, shopping, etc., Google accounts for a lot of web activity that companies used to enjoy on their own sites (or cough, in their brick-and-mortar department stores, RIP). Google has taken those aforementioned housekeeping tasks, like finding your location, your hours, and your contact info and made it comically simple. They’ve also mastered search, directions, photos, video, and finding relevant content. We shouldn’t. It would be silly. But what’s left to be done? What Google is not good at is creating original content with value—things like articles, products, customer case studies, product demos, recipes, quizzes, tutorials, contests to name a few. The possibilities are endless. The key is to make sure it’s good. If it’s not good then who cares? Good content provides value. Educational value. Entertainment value. Promotional value. Value. They share videos, articles, photos, recipes, gifs, memes, etc. Content is king and it behooves us to think in terms of content that is worthy of being shared by a customer. If you do it right, not only will customers have a better experience while on your website, but Google’s algorithm will love it too. The standard coffee shop website would probably include pages like Our Coffee, Our Company, Our Location, Contact. Pretty straightforward. I would argue, however, that most of that content is probably covered by Google. 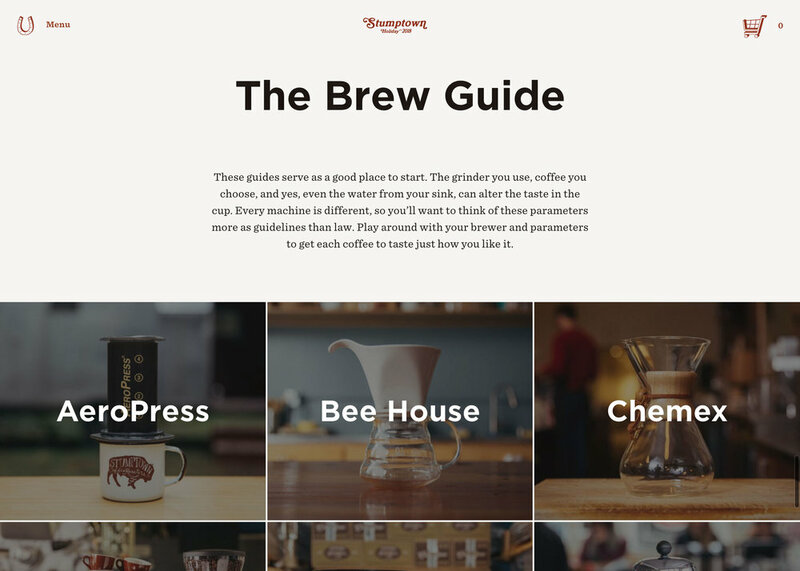 So, what would it look like if a company created something unique like Stumptown’s Brew Guide. I was blown away the first time I saw it. It’s important enough to them that it exists in the primary navigation next to products and locations. The guide is a series of text, photo, and video tutorials that investigate coffee from every angle. Through thoughtful content and lovely visuals, they’re able to demonstrate their coffee obsession, their expertise, and the kind of goofy personality that has given them a cult-like following. The content is brilliant and never gets old (I’ve watched every video at least once). It’s worthy of a share (which I have and currently am by writing this). Most importantly the content provides value (I learned and was entertained). Granted, Stumptown is no longer a small business with meager resources, but that doesn’t change the fact that they produced something amazing that Google’s algorithm never could. Having just had a baby, Wildbird comes to mind as a small business creating valuable content. 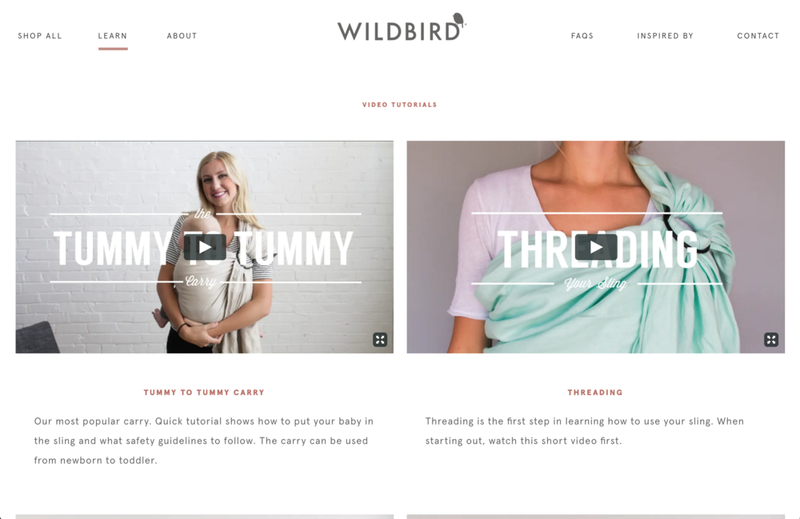 Wildbird makes designer ring slings that are all the rage in mommy circles. They are simply made, but with wide ranging patterns and color options. What struck me, aside from the lovely photography and stylish products, was the tutorial videos on how to use the sling. As a new dad, I know nothing about anything. Mom leads the way and I just make sure the kid eats, sleeps, and poops. So when she gave me the sling and told me to hang this fragile little troll-baby to my body, I was alarmed. After all, a ring sling is literally just a metal ring and a cloth sling. Luckily, Wildbird created a series of tutorial videos to help you get the most out of your sling—safely. What’s smart about the tutorial section is that the videos are an excuse to return to the Wildbird site after purchase. They are inherently sharable by customers as well as the brand in the company social feeds, newsletters, and blogs. And they demonstrate the sweet, tender connection between parent and child. What a great way to de-mystify the product while making Dad look like a winner. One of the best ways to demonstrate the value of your business is not to list features and benefits, but rather to prove that it’s already valuable to other people or businesses. It’s classic customer validation. Product reviews, press coverage, and testimonials are a classic forms of validation. You see it everywhere and the goal is always the same: let other people tell your story for you. Shopify did this for me with their Shopify Success Stories. When I started designing products under the name Local Gems Clothing, I didn’t know where to begin to start selling them. Obviously, I design websites and stores on a daily basis, but in terms of running a store day to day, I was lost. Sales tax, shipping, credit cards, inventory, email automation. Was this all necessary for a tiny little side project? Shopify answered that question for me by way of customer case studies. 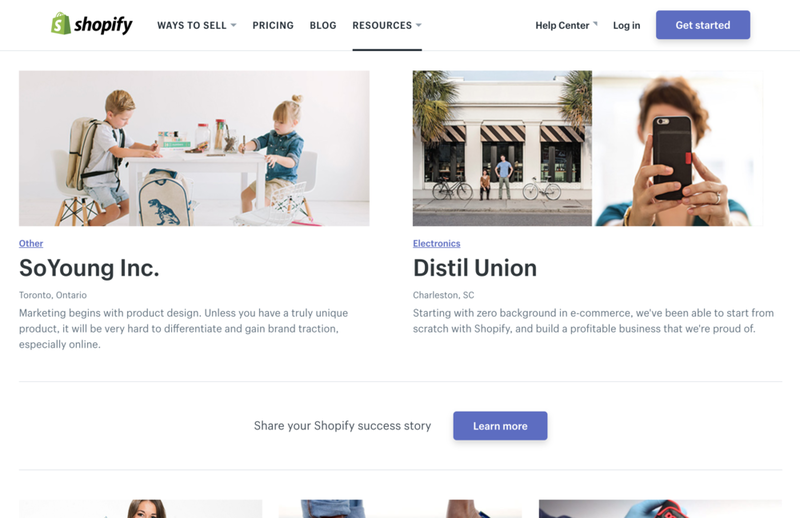 Through reading about shops just like mine, Shopify pulled back the curtain and showed me what the future could look like. I basically could envision the Shopify ecommerce platform working for me before I even signed up. Not only that, Shopify created a way to promote their many features and benefits IN CONTEXT without it feeling like a blunt up-sell. Shopify does a whole lot of things right in terms of how they coach customers through running their business (guides, free tools, software, hardware, podcasts, integrations, etc.) but this was particularly well-timed for me when I was getting started. By creating some well-placed case studies, they offered an enticing first taste of the Shopify world for a novice shop owner like me. The name of the game here is creating content with independent value—the good stuff. Google runs on the good stuff. Google exists to pass the good stuff on to its users. Users trust that Google exists to deliver the good stuff to them. However, Google does not create the good stuff for you. You have to give Google the good stuff like a relevant video, photo, video, blog post, tutorial, etc. If it is good and valuable, Google will find it and show it to your customer.